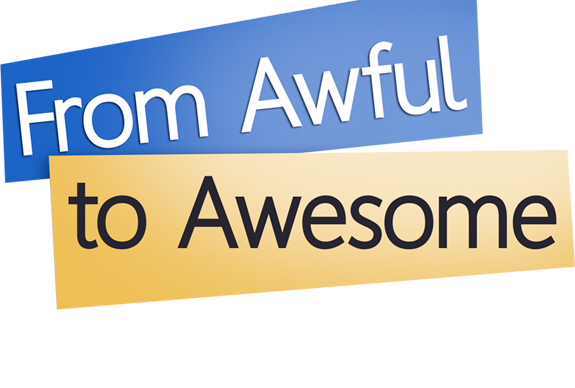 Have you ever attended an awful presentation? 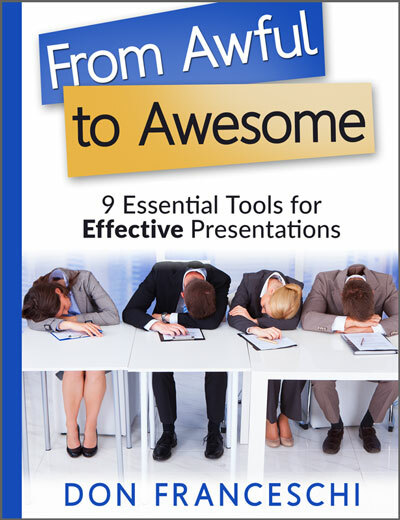 Don Franceschi has created a roadmap for inexperienced, infrequent, or ineffective business presenters with his book, From Awful to Awesome: 9 Essential Tools for Effective Presentations. 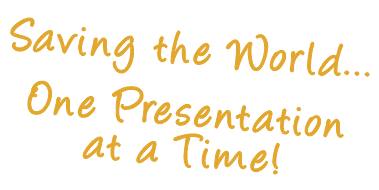 Let’s save the world — one presentation at a time! “Though aimed at the novice presenter, it is an excellent guide book for anyone, of any speaking level, who manages people, conducts group presentations or training’s, workshops, classes, etc.. There is tons of valuable information and tips for the would-be presenter here. Easy to read, fun and VERY informative, Don Franceschi gives you “The Right Stuff,” to get your presentation skills out of the closet (or toilet if you prefer), and onto the stage, through his some times fortunate and sometimes not, personal and professional anecdotes and experiences.